I’ve just returned from an amazing weekend in Barcelona. I went with my partner, Sam, and our baby boy, Joseph, who was 12 weeks old when we travelled. 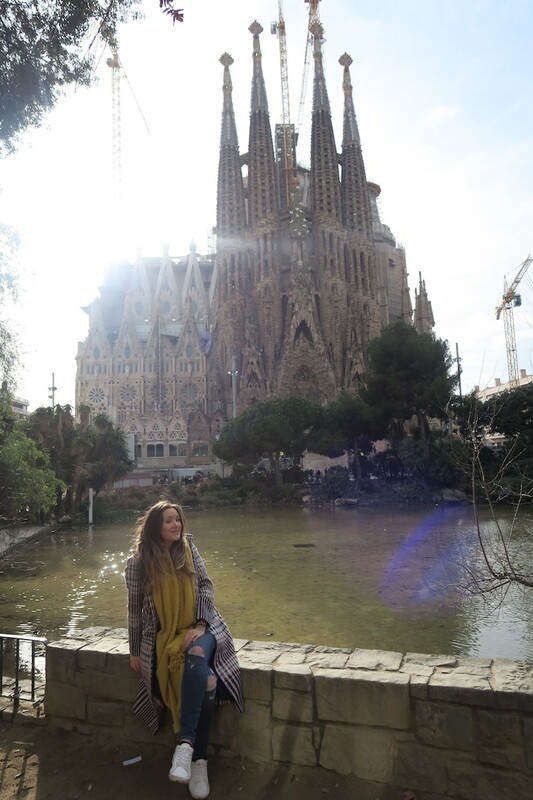 Since getting home I’ve had a few readers ask me what it was like to travel to Barcelona with a baby and if I thought it was worth it. I’m always trying to encourage people to travel with their kids. I’m a cheerleader for young families getting out and about as much as they possibly can and I like to show that your exciting life doesn’t have to stop when you have kids. 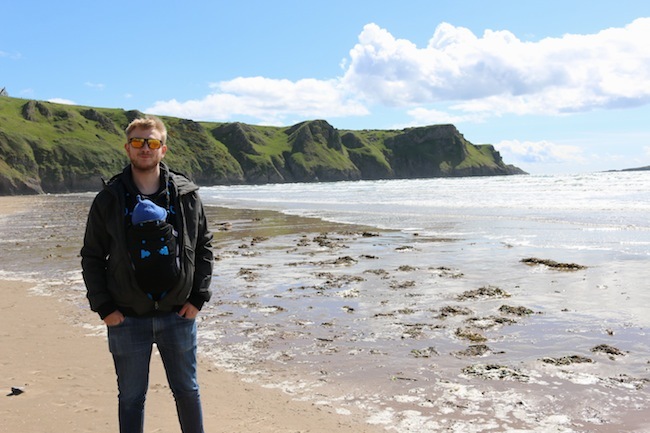 You’re not restricted to Centre Parcs and package holidays to Spain once you pop out a baby, you can still do really fun and exciting things! There are so many destinations around the world that are so baby friendly, I’m not sure if it’s worth the extra effort needed to take them to Barcelona. I just want to highlight that we travelled to Barcelona in January which meant we couldn’t enjoy the beach or the parks in the same way you would in the summer. This will have definitely effected our experience and I imagine the city is more child-friendly in warmer months. But in the winter months, I feel like we missed out on some experiences that we would have enjoyed if Joseph wasn’t with us. 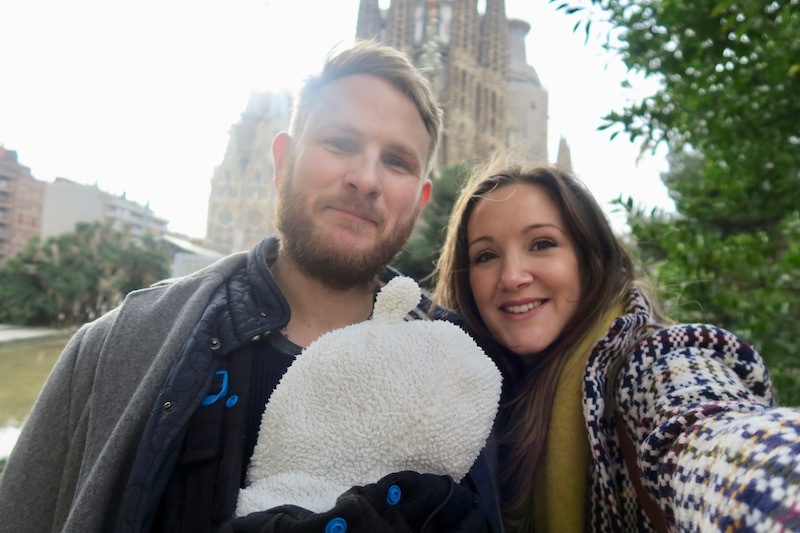 Here are my thoughts about travelling to Barcelona with a baby.. 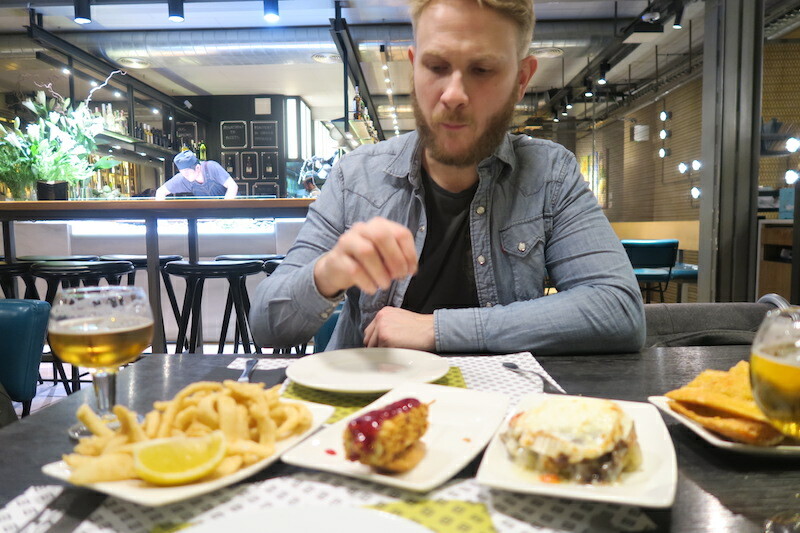 There are actually loads of things to do with young kids in Barcelona but one of the best ways to spend your time in the city is hopping between tapas bars. 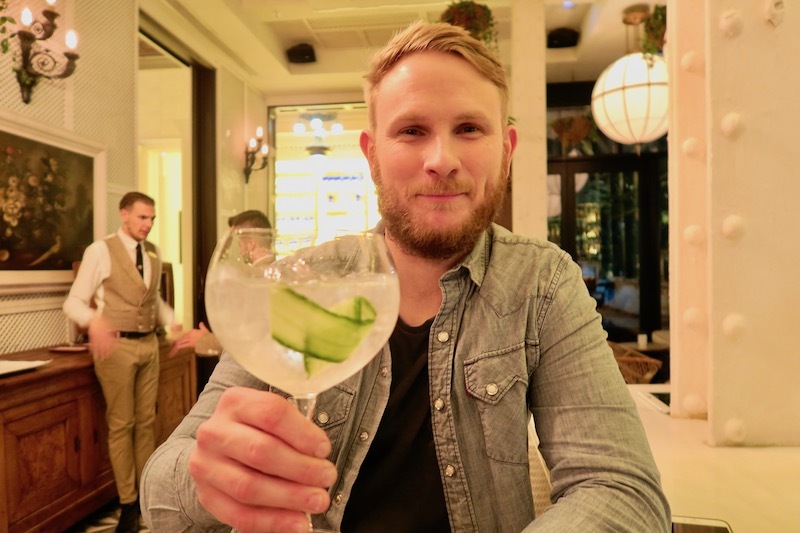 Yes, Barcelona is all about the food and wine and exploring these traditional little bars with their delicious little dishes. It’s not that you can’t take babies into a tapas bar…it’s just…well it’s just much more fun without them. In some ways, tapas bars are great for babies because you can pop in, have a tiny glass of wine and one little tapas dish and be in an out in 10 minutes before moving on to the next place (and before your baby wakes up and starts crying!) This works really well if your little one isn’t settled as you can leave before they have a meltdown or become irritable for staying still for too long. But, on the other hand, most of these tapas bars are small so they have a cosy, intimidate and romantic feel. The staff were all lovely and friendly but I don’t feel like it’s a baby-friendly environment. Also, you’re going to struggle to get in there with a pushchair. Now this where Barcelona becomes great for travelling with a baby. I personally find that babies are happy and relaxed when you’re walking and moving and constantly on the go – so walking to different sights, monuments and attractions is going to keep them settled. 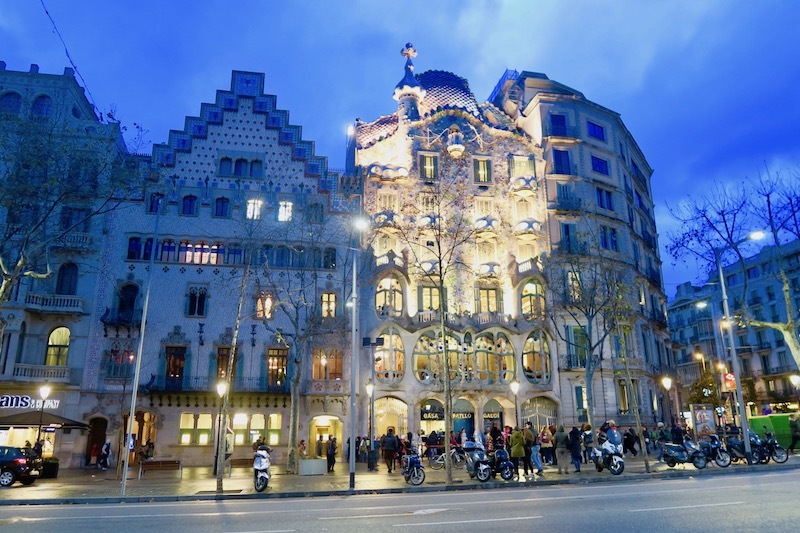 They’re not exactly going to appreciate Guadi’s finest work but they’ll definitely enjoy the walk as you stroll from Casa Mila to La Sagrada Familia to Park Guell. 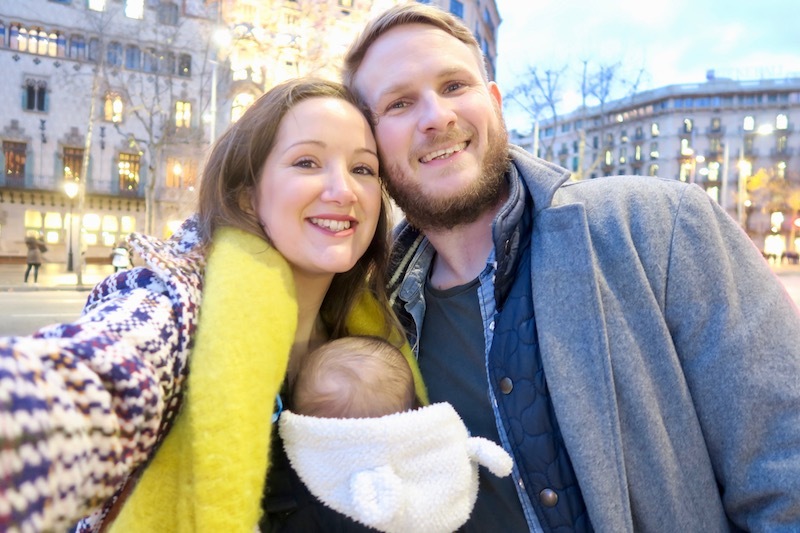 Our baby carrier was a total lifesaver in Barcelona. 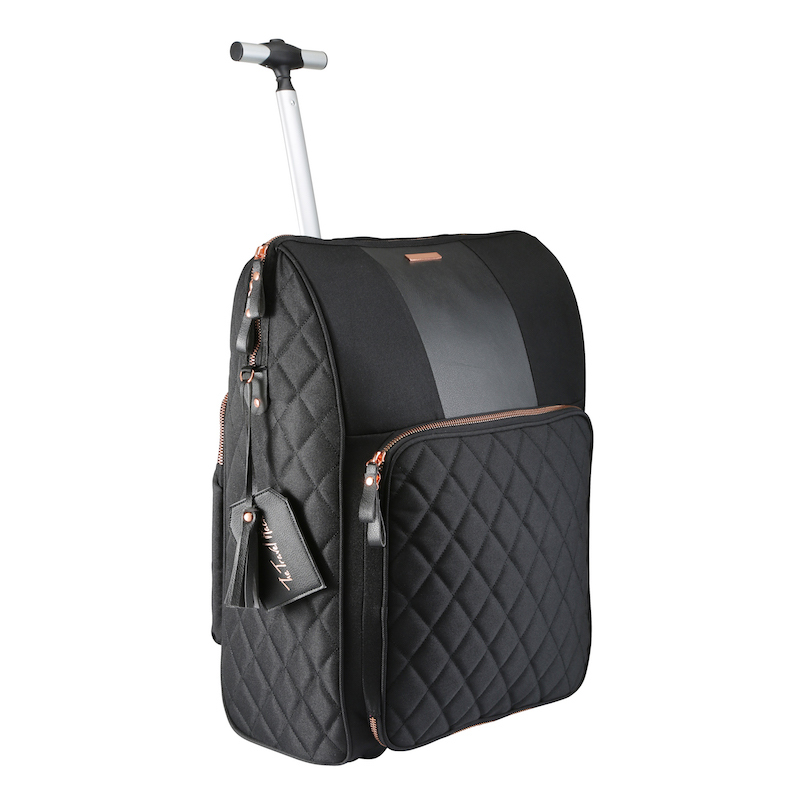 It made getting around really easy and you never need to worry about the bumps, cobbles, steps, busy streets, public transport or tiny shops and bars. Joseph also falls asleep the second he’s put in a baby carrier but even when he’s awake he’s happy to sit in there for ages. We have the Pao Papoose from We Made Me and I really recommend it. It’s comfortable to wear for hours and Sam and I are both happy wearing it. Sam feels a lot of the baby wraps and slings are a bit ‘girly’ but apparently this one is masculine enough 😉 You can read my full review of the Pao Papoose here. If you are taking a pushchair to Barcelona and you’re not sure what type to take, I’d opt for a simple umbrella stroller. I wouldn’t recommend the small, lightweight ‘travel’ strollers because they’re often expensive and usually miss the features you need for city streets. Look for something with chunky wheels, a comfortable ride, a big shopping basket, a huge hood and a reclining back so little ones can lie flat. This is an easy one as the Spanish tend to eat very late so if you go for dinner at normal dinner time then that will still be considered early. Eating at around 7pm is perfect if you have a baby with you. It’s going to be quieter and the atmosphere will be more family friendly. It feels a little inappropriate to have a baby in a restaurant at 10pm when everyone else is getting drunk or trying to enjoy a romantic meal. If you’re going to go to Barcelona with your kids at any age then the younger the better. At 12 weeks old, Joseph slept pretty much ALL the time. Tiny babies are easier to carry around in a sling all day, they’re easier to fly with, you don’t need to worry about them making a mess with their meals or find restaurants that serve kiddie meals. First time parents are probably a bit nervous about travelling with young babies – I know I was! But second time around I’m embracing it and getting away as much as we can. We stayed at The Cotton House hotel (uber posh!) and it couldn’t have been better. I’d never stayed at a fancy hotel with a baby before and it actually turned out to be great. 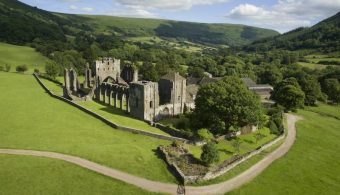 The staff were so lovely and welcoming, the room was enormous and spacious, we had a terrace so we could sit outside while Joseph slept and there weren’t any other rooms next to us so we didn’t need to worry about the noise. I’m 100% not saying you shouldn’t take your baby with you to Barcelona. But I am saying that it’s a bit of extra effort and you’re going to miss out on some experiences when you have your baby with you. For me, there are hundreds of baby friendly destinations so I’d rather travel to one of those and save Barcelona for an adult-only weekender. The kind of weekender where you drink too much wine, eat too much food, stay up late, have breakfast in bed and enjoy the sights without thinking about nap times and feeding times. Our Joseph was about 20 months when we took him to Barcelona and I actually found it really suited us with him at that age. I think it helped because it was Spring and he was able to run about in the many playgrounds that seem to be everywhere and are really well kept. I found the pavements for the most part pretty good for the buggy. But I totally know what you mean about tapas bars and feeling like they could be more fun without the kids! I’d happily go back, but I am also glad we’d already been to enjoy the food and the wine carefree before he was born. FYI we stayed in an apartment off Passeig de Gracia and it was perfect! That’s good to know. We did spot a lot of play parks and realised it would have actually been OK to bring George (who is almost 2). We left him at home with my parents because we thought Barcelona with a toddler would be a nightmare but it actually would have been OK. I’d like to go back (maybe with grandparent babysitters in tow) so we could enjoy all the outdoor spaces with the kids in the day and then the nightlife without the kids at night. That would be perfect. If you do go, definitely go when bubba is as young as possible or in the summer when you’ll be outdoors a lot. I think a summer trip would be much easier! You guys are so brave! My wife and I have been putting off having kids so that we can travel more…(selfish, I know). But seeing yall go to Barcelona with a little one looks pretty awesome! I don’t think that’s selfish at all! There’s a lot you can’t do when you’ve got kids so do it all now! Haha. I know what you mean, love Barcelona and been 5 or 6 times before babies..;) but in 4 years didn’t take the kids yet…In May will bring them to Ibiza for my birthday celebrations but flying our nanny as well. Spain is just too much fun food, drinks & vibes to miss out! Ahh, a nanny! That’s what we need! I hope you have an amazing time, I’m sure you will! We have not visited Barcelona yet but it is on our bucket list for this year! Would you say there are things to do with our two year old? We usually travel with our daughter. She is pretty good about it. She has been to 7 countries already and we did not think it was hard or anything. Here is to many more travels with little Joseph. He is so adorable! Happy travels. Thanks Vrithi! I also have a 2 year old so I know the feeling about keeping them entertained on long flights. It’s so easy when they’re little and all they need is milk and cuddles! I think you could have a great holiday in Barcelona with a two year old. I think it depends on the child and I know my two year old would love it but we’d still end up missing out on the wine bars and tapas bars. But if you’re ok with that then I think it’s great. 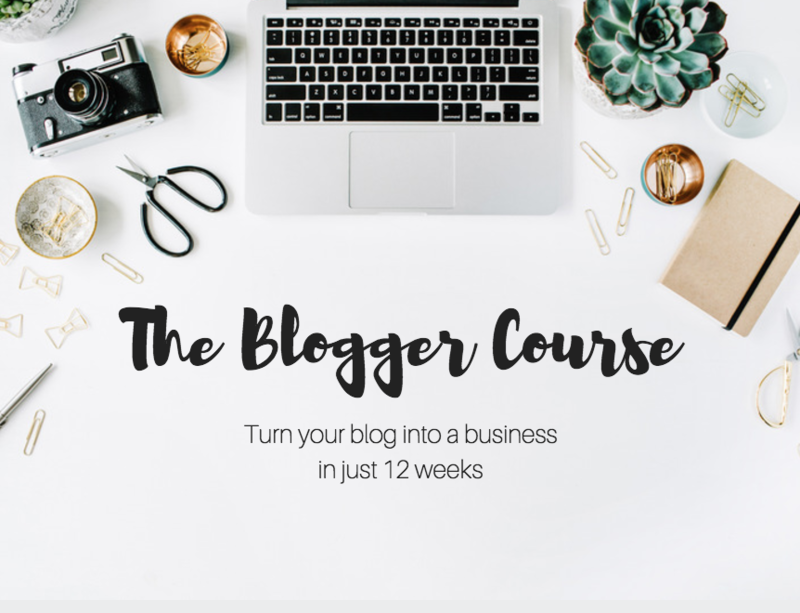 I’m so glad I stumbled upon your blog! I love travelling and have been residing in Vancouver, Canada with my husband for the past 3 years after we moved there from London UK. We love travelling and have found our current base to be a good launch pad to other destinations. We are also committed to the idea of starting a family soon, but worry about the impact that will have on our travel pursuits, as we have so many more pins to drop! Reading your stories on how you do it with babies in tow is such an inspiration. Keep doing what you do.